It’s time to reclaim your parking space. When your garage becomes the dumping place for everything imaginable and begins to resemble a junkyard, it can be tough to take back control. The shovels, the sporting gear, the kids’ art projects from last fall — it’s all in there somewhere. Don’t let your garage become a place you dread coming home to. Check out there 6 tips for an enhanced, more organized garage space. Tip #1: Part with what you don’t need. The first step in your quest to uncover your parking space is purging your space of things you don’t need. Unless you’re expecting a major disaster, you probably don’t need that fourth snow shovel resting in your garage. In fact, you’d be surprised to find a lot of things that would be better off donated or tossed. 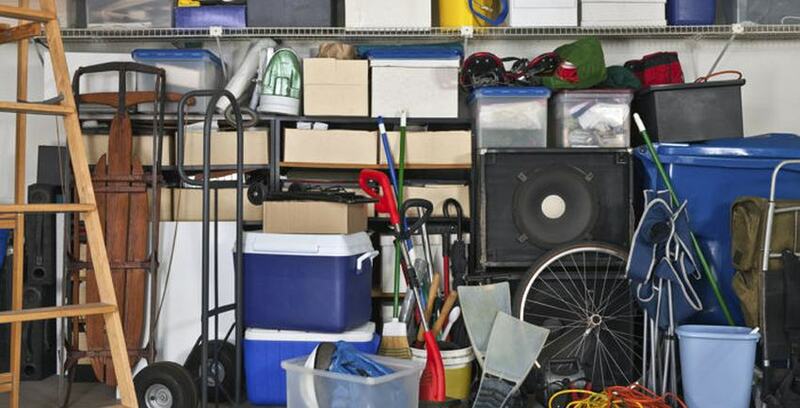 Separate your belongings into “keep” or “toss” piles as you begin to tackle garage organization. The camping gear doesn’t belong with the sidewalk salt or windshield wiper fluid. Designate specific areas of the garage for different categories of belongings. That way, you can quickly find the baseball bat in its place instead of digging through a pile of extra paint cans. If you’re feeling extra ambitious, use labels for easy access and organization. Tip #3: Think “On” The Wall. If you’re looking for off the wall storage ideas, consider taking advantage of vertical storage on your wall. Beyond traditional shelves, install pegboard or wall panels for convenient storage for your gardening tools and equipment, or magnet strips for your other tools. Moving your things from your floor to your wall will free up valuable space. Tip #4: Consider the ceiling. Your walls aren’t the only place you can store your extra lawn supplies and DIY projects. You can also take advantage of ceiling storage. There are a variety of kits and other options for installing mounted ceiling storage, especially if you have a higher ceiling in your garage. Are your bikes taking up space in the winter? Try putting them in your ceiling storage. Tip #6: Transform your space. When your boots are full of mud, or there are energetic kids getting home from school, it would be nice to have a place to unload everything without tuning your house into a zoo. Especially if you don’t have a large entry way, try turning a corner of your garage into a mud room. You won’t have to worry about keeping the space extra clean or tracking the outdoor elements into the house. Besides, this is your chance to add a little extra design flair to the corner of your garage. If you’re still short on space, Storage Direct is here to help. We offer short and long term storage for everything from cars to boats. Climate controlled options are available to keep your items safe and sound in one of our secure storage facilities. Contact us today to find a location near you!